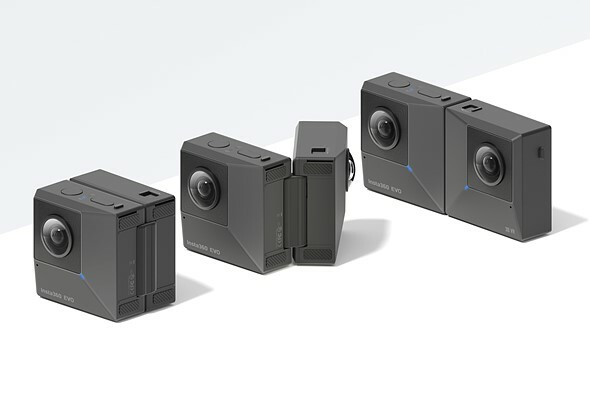 Insta360 has launched EVO, a cube-style camera that shoots 360-degree and stereoscopic 3D 180-degree video footage and stills thanks to its unique folding design. The camera features the same 5.7K video resolution and 18-megapixel still resolution as the Insta360 One X, as well as Insta360's six-axis FlowState stabilization technology. 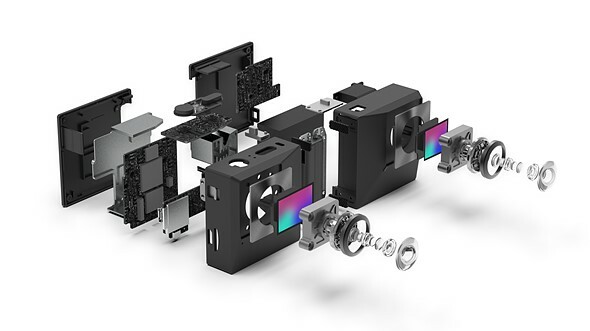 In fact, the camera as a whole has similar specs to the One X as a whole, including F2.2 apertures on both lenses, various exposure modes in video and stills, Bluetooth 4.0, 5Ghz Wi-Fi and a microSD card slot with a maximum storage of 128GB. But the internal specs are where the similarities end. Unlike the One X, the EVO doesn't have any integrated LCD display. Instead, the camera features a hinged design that enables the cameras to capture a full 360-degree image when the lenses are facing opposite directions or stereoscopic 3D 180-degree images when the EVO is folded out with the lenses facing the same direction. The camera itself has only a few buttons and ports on it, including a power button and a button for switching between various shooting modes and settings. On the side of the camera is the microSD card slot and a micro USB slot (unusual Insta360 didn't opt for a USB Type-C port instead). Since the EVO doesn't have a screen of its own, the camera is dependent on an Insta360 EVO app to compose the images, change the settings and overall control the camera with more finesse than the limited on-device controls. The app will be available in the iOS App Store and Google Play Store. The EVO is currently available for order on Insta360's website and B&H for $419.99. 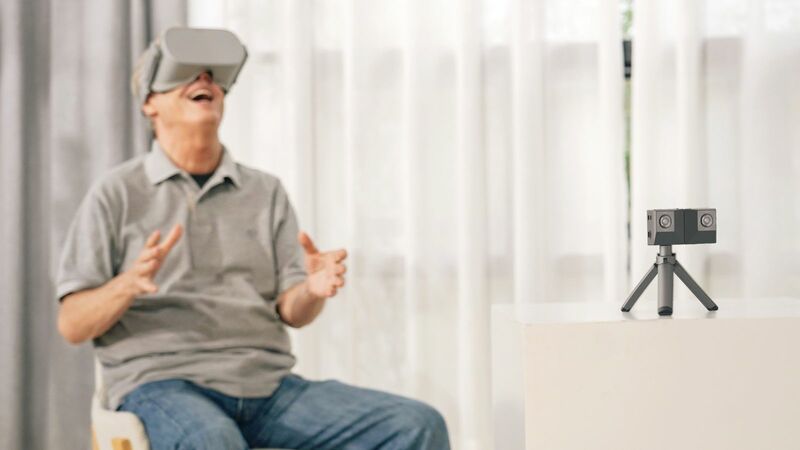 Insta360 has also announced Insta360 VR, a new app for Oculus Go, HTC Vive Focus and Samsung Gear VR that will allow users to connect an EVO camera to a headset for simple wireless playback of the stereoscopic 3D 180-degree video or 360-degree video. The HoloFrame is available for iPhone X/Xs, iPhone X Max and iPhone XR for $29.99 from Insta360's online shop. The article should have mentioned that this is INSTAs reaction to the Vuze XR https://vuze.camera/camera/vuze-xr-camera/ . Good, good move! Finally! I wish the halfs would separate to use wider stereo base... I wish lenses were zooms and the folding allow pointing both lenses to a closer object! It only has mobile OS apps? There is no "Insta360 EVO" Win/macOS version? I'm kind of split (ha!) on this. I mean, if I want 3D I suspect I want 3D 360 as well. Unless two of these are cheaper than most 3D 360? This new camera is so blocky, should be possible to use two at the same time. Post production might be difficult, somebody here might know. 3D 360° is infinitely more complex. You can't just put two of these back to back because the parallax required for 3D will only line up properly if you look straight forward or straight backward. As soon as you get too far off axis you'll start to lose the 3D effect. I thought 3D was dead. Can't even buy a 3D tv new now. You thought it was dead forever? It was dead. For a short time. Time to wear stupid glasses again?! No, its for head mounted displays. 3dtv is dead. This has nothing to do with 3dtv. VR is not 360° video and 3D video. What these are for are like 3D TV tried to be. A Google goggles etc are same way just failed for masses. A 360° videos are funny for few first times, then you just don't care anymore. Too boring and confusing to look around, try to find what you are suppose to find etc. That is why television is so successful that you come home and start watching something without settings and figuring out. You have your daily work behind, all that you want is to rest. THE most important spec for stereoscopic use is not mentioned. WHAT IS THE INTERAXIAL DISTANCE? This has a significant effect on how close the closest subject tcan be, while including very distant subject matter, for stereoscopic viewing comfort. Don't you need more lenses to take 3D 180 degree? Won't this one only work if you look up and down? Why would it need more lenses? The two lenses are 180° so what else do you need? The blind spot area behind the other protruding lens I'm sure can be fixed with the image from the second lens along with some software magic. In 99 % of cases I would guess it won't be noticeable at all. The 3D effect will certainly be degraded when looking not forward. Software magic, you say? Maybe. I think I would rather read a review before deciding upon that. 3D is available only with both cameras facing forward. With one facing forward, the other back, you have 360 degrees, but not 3D. Of course, that is why I asked about 3D 180 and not 3D 360. The 3D effect will almost certainly degrade at the extreme left and right but it may not be as bad as you think. You can check sample footage of the Vuze XR or Z Cam K1 Pro if you want an idea of what to expect. Exactly, I still cant use any android app because my phone isnt one of the handful they support for the One X. I assume the EVO also would not be supported at all. It causes problems because the camera cannot do some functions at all without that, like setting iso for stills. So, I cannot go indoors and shoot a 360 photo at anything other than auto iso, which is worthless. They think everyone owns an iPhone. Total nonsense. Nobody cares about 3D video. 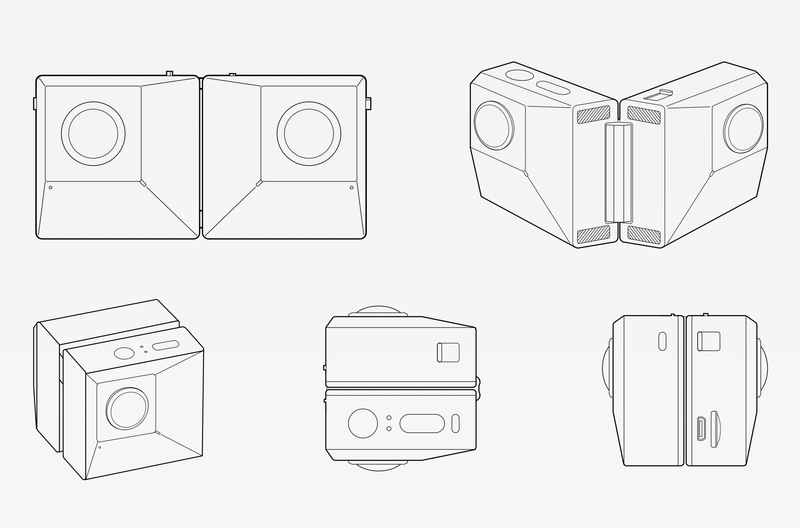 Stop wasting time making cameras with this useless tech. It’s gone nowhere in all these years! It’s not starting now. Barley anyone even watches 360 video! Not so. It's now widely used in specialized applications. This camera is getting a lot of attention. Its due to Head Mounted Displays, which I assume the OP does not have one. vr180 is a VR format, not a 3dtv format. Its for HMDs. Any word on VR180 compatibility? No specific mention of the sensor size in the press material. I'll contact Insta360 to see if they'll disclose that. my question as well...I'm guessing it's their old sensor, etc. they just put it inside a foldable body. 2/3"? I wish! I think you mean 1/2.3". Such a simple concept but really cool. Sad it doesn't really work for stereo video as you have no means to adjust the cameras distance depending the focus distance and separation. This could all be done through software by cropping and overlaying. Focus shouldn't be a problem with the wide fov and deep dof provided by action cams usually fixed focus lenses. You can not get it done with software. It is a perspective that needs to be changed. Its a stereo video camera. Almost none are perfectly aligned, and yes you can fix this all in post, just not perfectly, but generally you don't need it to be perfect, you just need the parallax to be close. Even if it were two fixed lenses, those aren't perfect either. You always correct a bit in post. These days, any decent software can run through morphing perspective changes and keystone correction and all kinds of things to correct slight differences in the parallax. The hinge not being solid may be way more of a problem. If the lenses move at all during filming, its worthless. Its a compromise for sure. I would rather see a fixed lens system for vr180 mode. I have a custom vr180 rig and you can only get so close with alignment, you always correct in post some. It is all captured in the camera, with two, with mirror splitter. Other is recording 90 degree while other directly. You lose 50% of light but not a problem. How much you want separation and what distance, rule how much you separate cameras and change DOF. No DSLR or any smaller cameras could do it because technical limitations in them for production quality, but you can have a hobby and try to fake things but it never looks good, just gimmick. "Sad it doesn't really work for stereo video as you have no means to adjust the cameras distance"
It will work just fine for objects that are suitably close to the camera, which is all the target market cares about anyway. Each distance requires adjustment, closer you are, more accurate you need to be with measurements and settings. There is no way to do it in software. Getting a fixed cameras means you are fixed, you need to work to like or not like the results and just accept that it looks weird or bad most the time and that you didn't get what you wanted. Every consumer device I've seen has had a fixed distance between cameras. I'm not arguing that it's ideal, but most of the target market would have no idea what to do if they were adjustable anyway.